Harold Camping: World will End on Friday… And this Time he Means it! Remember earlier this year when the world didn’t end? 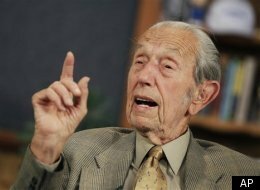 Like every other doomsday prophecy throughout history, the May 21st rapture promised by Oakland-based Family Radio network owner Harold Camping never materialized. The 90-year-old, self-styled prophet now claims the world will end by this Friday and not with a bang, as previously predicted, but rather with a whimper. You’ll note the word “probably.” Catherine Wessinger did. She’s an expert on doomsday groups at Loyola University in New Orleans and editor of The Oxford Handbook of Millennialism. She says she’s seen this before. What really happened this past May 21st ? What really happened is that God accomplished exactly what He wanted to happen. That was to warn the whole world that on May 21 God’s salvation program would be finished on that day. For the next five months, except for the elect (the true believers), the whole world is under God’s final judgment. To accomplish this goal God withheld from the true believers the way in which two phrases were to be understood. Had He not done so, the world would never have been shaken in fear as it was. The rest here (if you could be bothered).